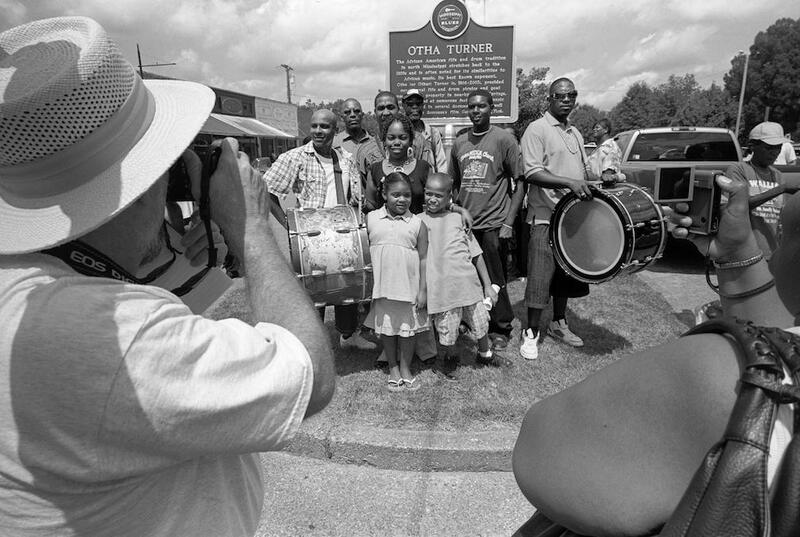 Though his music has been featured on recordings, on television, and in documentary and feature films, Otha (or Othar) Turner is perhaps best known for the North Mississippi picnics and performances he hosted. He was born in Rankin County, Mississippi, on 2 June 1907 to Hollis and Betty Turner. His father left soon after his birth, and his mother moved the family to the Gravel Springs area near Senatobia, where she worked as a sharecropper. Except for nine months spent laying railroad ties in Muncie, Indiana, Otha Turner remained in Gravel Springs for the rest of his life. As a teenager Turner plowed and chopped cotton, watched over younger family members, and learned to play makeshift drums, washtub bass, guitar, and cane fife. His introduction to the fife, which became his signature instrument, occurred at age thirteen, when he witnessed a performance by neighbors. Despite his mother’s admonishments against musicianship, Turner practiced the fife incessantly and began to make the instruments himself, a process documented decades later in the film Gravel Springs Fife and Drum (1971). As a young man, Turner performed in Tate, Panola, Lafayette, and other North Mississippi counties and formed an ensemble, the Rising Star Fife and Drum Band, featuring a bass drum and one or two snares in support of his fife (and to a secondary degree his singing). An important venue for his and other fife-and-drum bands was the frequent picnics and social gatherings demarcating such holidays as Independence Day and Labor Day. These events set the standard for the annual Labor Day goat roasts or “picnic parties” Turner held on his farm in later decades. Many folklorists believe the African American fife-and-drum tradition to be a unique offshoot of US military or militia marching-band tradition blended with both African and African American musical styles. Supporting this theory is the fact that leading up to the Revolutionary War, though slaves were legally bound to participate in militia training, they were generally restricted to work as parade musicians. Though both white and black versions of fife-and-drum ensembles existed in colonial New England, records indicate that in the South, both during and after the Civil War, they were primarily black outfits. In the Reconstruction-era South, fife-and-drum groups flourished within the black community, performing at parades, holidays, and other social events. The form continued to evolve musically as well, as bands blended military marches with African drum traditions, minstrel tunes of the early nineteenth century, slave songs, and blues. Alongside Sid Hemphill and other fife players, Turner’s Rising Star Fife and Drum Band performances were a noted part of North Mississippi’s musical landscape during the middle decades of the twentieth century. Despite the waning of the fife-and-drum tradition, folklorists began to take note in the late 1960s. Both George Mitchell and David Evans recorded Turner in the latter part of the decade, and his songs appeared on several compilations associated with the region. Alan Lomax first came across Turner in the late 1950s, though only because Lomax asked directions to find Mississippi Fred McDowell. Turner later appeared in Lomax’s 1978 documentary, The Land Where Blues Began. William Ferris documented Turner’s fife-making techniques in his book, Afro-American Folk Art and Crafts. As his reputation grew, Turner accepted invitations to perform for larger audiences at events such as the New Orleans Jazz and Heritage Festival and the Chicago Blues Festival, but he did not gain formal recognition for his efforts until the 1990s, when he was well past age eighty. He received the National Heritage Medal from the National Endowment for the Arts in 1992, and his first solo recordings appeared later in the decade. Fans from around the country and even the globe began to attend his annual picnics in Gravel Springs. Perhaps his broadest exposure came via the opening scene of director Martin Scorsese’s 2002 film, Gangs of New York. As precursor to a battle between two gangs, the director used Turner’s version of the fife standard “Shimmie She Wobble” as soundtrack. He also received the Smithsonian Lifetime Achievement Award and the Charley Patton Lifetime Achievement Award from the Mississippi Delta Blues and Heritage Festival. He died on 27 February 2003 and was honored with a marker on the Mississippi Blues Trail in 2009. Turner’s legacy is carried on by young musicians he shepherded, including the North Mississippi Allstars, Slick Ballinger, and family members such as Turner’s granddaughter, Shardé Thomas, who is now a heralded fife player and leader of the next generation of the Rising Star Fife and Drum Band.